In 1931 the Brandon Unemployed Council was created in Brandon. Led by local members of the Communist Party, it was designed to organize and to assist the growing numbers of jobless workers in the city. Throughout the thirties it was a highly visible and active organization. By the middle of the decade two thousand people were estimated to be members of the Council. In December 1935, the Council’s executive committee initiated the publication of a bi-monthly newsletter called the Brandon Unemployed Worker. 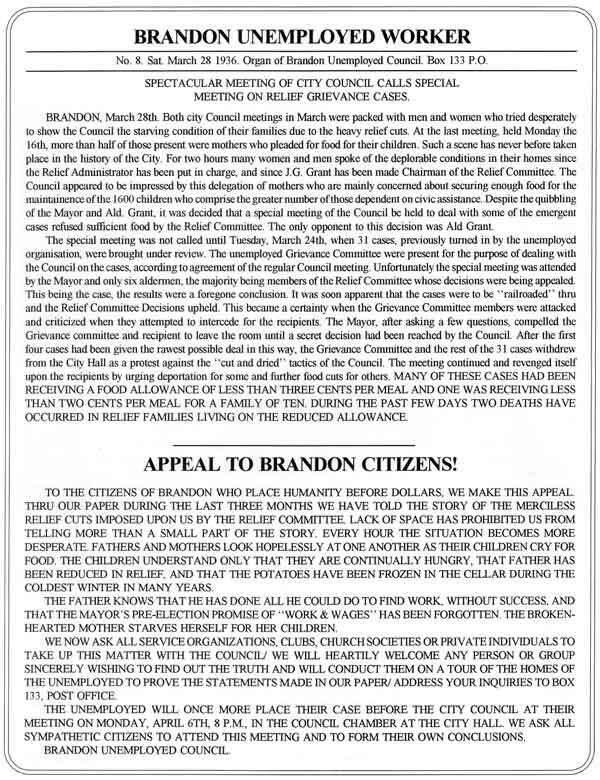 Designed to compete with the conservative Brandon Daily Sun in shaping the debate on the treatment of the unemployed in Brandon, the Worker appealed to “all citizens who are in favour of granting the most maligned section of the community A Square Deal. Unlike the Sun, which supported the municipal government’s decisions and policies, the Worker criticized various actions of the City Council. The Brandon Unemployed Worker also had an educative and organization function for the unemployed. It provided a forum for the consideration and advocacy of alternative, practical solutions to the economic crisis of the depression. Stan Forkin, Editor of the Brandon Unemployed Worker. 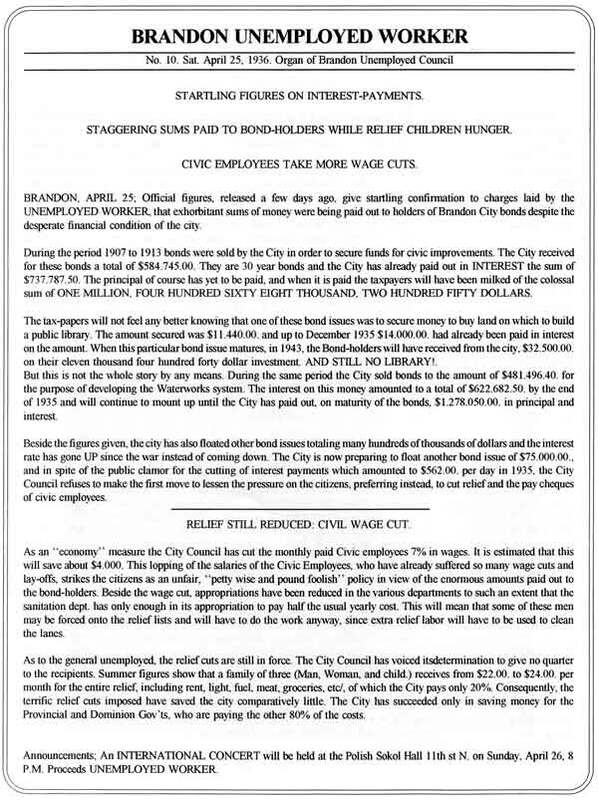 Reports such as this one demonstrated to the newsletter’s readers that the City Council was unfair in its treatment of relief recipients. Furthermore, readers were encouraged to attend the Unemployed Council meetings and accompany its members to the City Council meetings so that they could learn more about their precarious situation in the capitalist economy. Although the Worker ceased publication in June of 1936, its contributions to the political education of its audience were significant. Readers were informed that there were alternative solutions to their existing economic crisis. They were also exposed to a different political agenda than that espoused by the Brandon Daily Sun. Appealing to those who were most affected by the depression, the Brandon Unemployed Worker contributed to the creation of a new critical consciousness among the city’s jobless workers in the midst of the Great Depression. 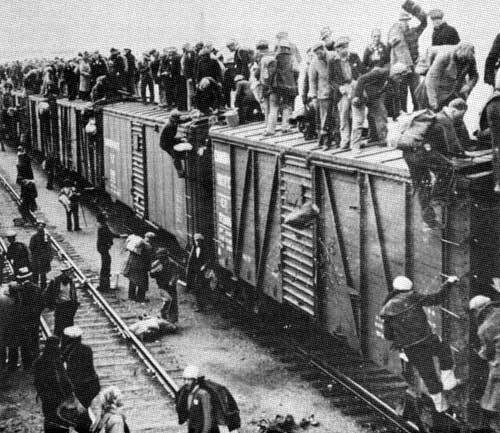 Unemployed workers ride the rails in 1935 as part of the “On To Ottawa” trek. 1. McKee Archives, Brandon University, RCMP Files, #96-A-00078, p.1663. 2. 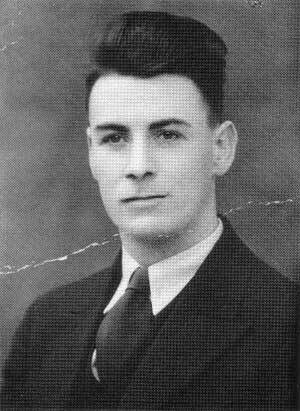 Brandon Unemployed Worker, 14 March, 1936. 5. Ibid, 29 February 1936. 6. Ibid, 18 January 1936. 7. Ibid, 11 April 1936. 8. Ibid, 5 February 1936. 9. Ibid, 9 May 1936. 10. Ibid, 4 January 1936.